You might remember the big jar of Pickled Mustard Greens I made. 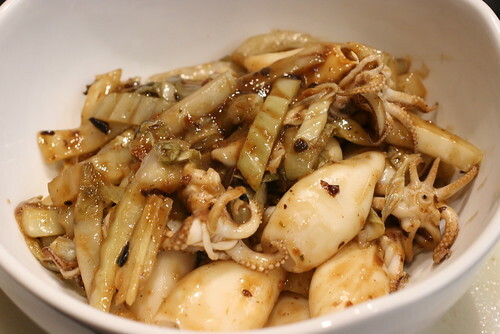 One of the best reasons to make it, is this dish, Squid with Pickled Mustard Greens. It’s a traditional dish I grew up with and have always loved. You’ll find it on menus as a lunch special over rice, but it might be an acquired taste (Lon did not like it). 1. Boil a pot of water with a dash of salt. Blanch the squid for 5 seconds and drain. 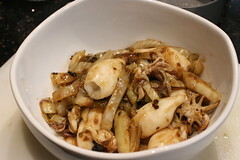 In a medium bowl, toss the squid with cornstarch. 2. Heat oil in a wok and swirl around. 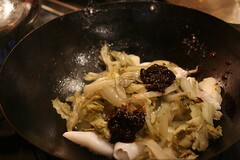 Add squid and ginger and stir for a few seconds. Add mustard greens, garlic black bean sauce, and sugar. Stir around until it looks saucy, about a minute. Serve over rice. posted by jessica	at 11:36 PM	Filed under Chinese, Recipes. You can follow any responses to this entry through the RSS 2.0 feed. Both comments and pings are currently closed. I just don’t think I could bring myself to eat this although I would at least try it! It’s the rule. Can’t say you don’t like it until you try it!